My art provokes an inquiring glance at a human-made future in which self-conscious machines are members of our society, artificial environments merge with nature, and physical realms converge with digital. I construct installations from autonomous objects that together form artificial-nature habitats. I work with a variety of media from sculpture and installation to painting and robotics. Some of my works are endowed with artificial agency and life via electronic and computational components, others combine traditional techniques with digital fabrication. 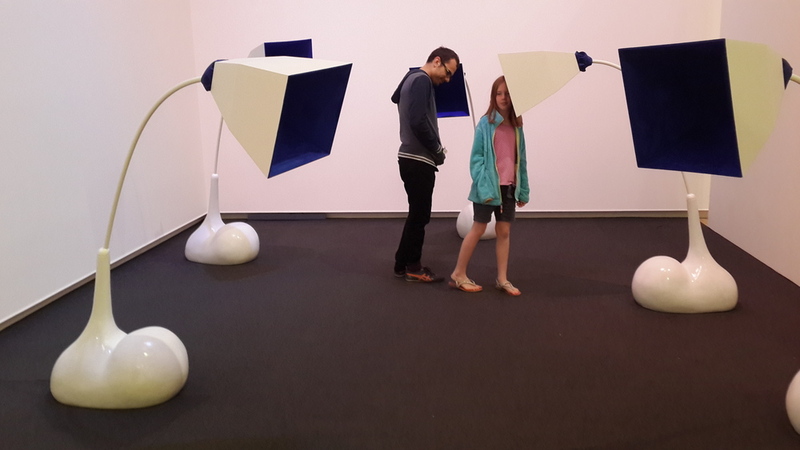 My interactive installations investigate human-machine communication and the human emotional response to it. My nascent body of work explores the Homo Technicus relationship with land and landscape. Industrialization and consumerism not only change the natural balance but also alter the hierarchy of values of the contemporary individual. In my work I attempt to reflect and accentuate this change. Using the aesthetics of designed commodities and a bright, whimsical visual language I lure the viewer into my work. Once inside one notices the misplaced relationships between the signifier and the signified and the tension between the physicality of the material and the virtual elusiveness of the object. Without being didactic, my work triggers contemplation on one’s physical and mental environment and the future of our planet. Vita Eruhimovitz (born Kharkov, Ukraine) grew up in Israel and currently lives and works in New York and Saint Louis. Vita holds a BFA from Shenkar College (2012) and an MFA from Washington University in Saint Louis (2015). Vita’s background in computer science and bioinformatics and her interest in science and technology inspire and inform her work. She works in multiple media such as sculpture, installation, and digital media. Vita is interested in the ways the modern culture perceives nature and pushes the boundaries of the physical nature into the digital realm. She explores the ways in which human-made spaces, systems and relationships interconnect with the environment that is being constantly modified by humans. Her recent focus has been in interactive sculpture and digital fabrication. Some of her projects reflect on artificial intelligence, machine learning, and the secret life of algorithms. Vita is an art professor at William Paterson University in New Jersey. Her art has been shown nationally and internationally, including, the Mildred Lane Kemper Museum and the Contemporary Art Museum in Saint Louis, and at the San Diego Art Institute Museum.